Extending My Barkday Card Drive. Hello everyone, it’s me, CEO Olivia. I was thinking the other day, I have over 11,000 followers on Facebook. 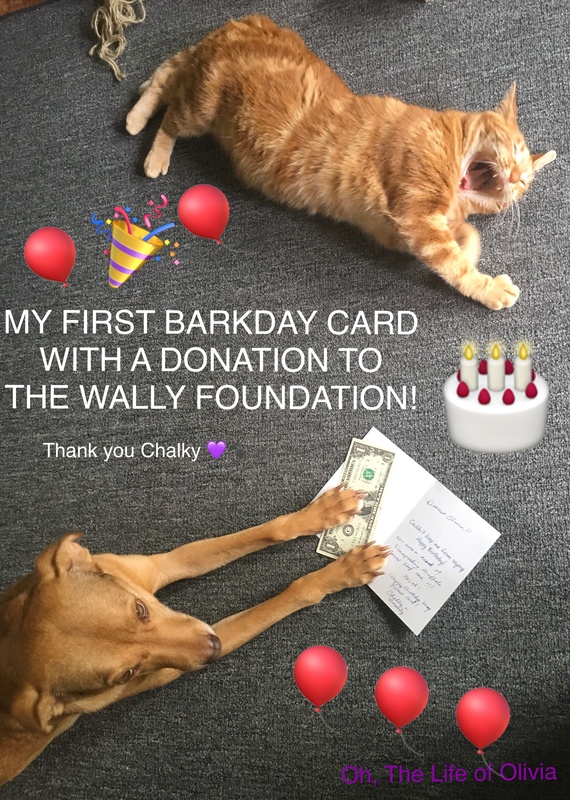 Imagine if every one of my followers donated a single dollar to the Wally Foundation through my Barkday Card Drive. That would go towards helping so many who are living with canine epilepsy. The Wally Foundation‘s objective is to assist humans who have dogs living with epilepsy, as well as dog rescue & animal shelters, in paying for epileptic medications & treatments, & to financially assist research towards finding a cure. I’ve been informed that there are cards making their way to me in the mail & they may not arrive before my Barkday, so as CEO, I have made the executive decision to extend my Barkday Card Drive until the end of the month. June 30th. The winner will be announced on July 1st. Rick Selwood, the executive director of the Wally Foundation has added a $25 Amazon gift card to the prize pack. How pawsome is that!? Please help me & my huMom celebrate my Barkday. A card with a $1 donation to the Wally Foundation is what I want for my Barkday this year. Or you can make a donation through PayPal, just leave a note saying, “Olivia’s Barkday”. The celebration starts! Enjoy every birthday greeting, dear Olivia.